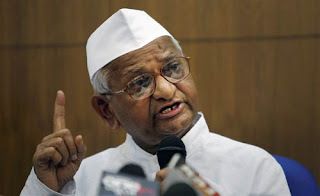 NGO News blog, NewsLine: Anna Hazare fought for ‘Right to Information’ now fasting for ‘Effective Jan Lokpal Bill’. Anna Hazare fought for ‘Right to Information’ now fasting for ‘Effective Jan Lokpal Bill’. Mr.Anna Hazare is one of India's well-acclaimed social activists of Maharashtra State has emerged as great social activist of the India. Anna with his ‘do-or-die’ fast geared up Government of Maharashtra for enacting the Right to information Act in 2003. Currently and now he fasts at Ramlila Maidan in New Delhi for ‘Corruption free India’ appealing Government of India to enact an effective Jan Lokpal Bill. A former soldier in the Indian army, Anna is well known and respected for upgrading the ecology and economy of the village of Ralegan Siddhi which is located in the drought prone Ahmednagar district of Maharashtra state. Mr.Hazare is now synonymous with rural development in India.The common man is put to lot of hardships and it has become difficult to make both ends meet as prices of essential commodities are rising constantly due to corruption. Hazare believes that our freedom is at the teeth of danger due to corruption and unless it is eliminated, the country will not be free in its true sense. Therefore, a peaceful war has been waged against corruption with the help of immense support from people. In the Maharashtra State, a campaign was started demanding for the Right to Information. As Peoples Representatives and Civil Servants are public servants and the citizens of Maharashtra are owners of the public money, the citizens have the right to ask the public servants how and in what manner they spend the public money. He pressed for legislating an Act for Right to Information. The first campaign was organized at the Azad Maidan, Mumbai, in 1997. State-wide tours were held for awareness generation among people. Any government never wants to decentralize its power and hand over power to people. Finally, with zeal of ‘do-or-die’, Mr. Hazare went on fast-unto-death on August 9, 2003 at Azad Maidan, Mumbai. He decided that unless the Act is passed by the Government, he will not end his fast; rather he will sacrifice his life for people’s rights. On the 12th day of his fast, the Government of Maharashtra enacted the law of ‘Right to Information’ in Maharashtra. The Act on ‘Right to Information’ is a revolutionary step towards strengthening democracy. This Act has enabled the common man to seek information. By the advent of this Act, the Government Agencies have to obey the law and the people have got controlling power.